The karmic interactions of near-death experiences coupled with the “spiritual but not religious” theme set apart a controversial new title carried by Amazon, Barnes & Noble and New Leaf Distributing Company. ‘An Upraised Chaliceﾒ has received dozens of 5 Star reviews and is described as spiritual adventure story spanning the earth. According to ASEMC Press, many are looking for answers to age old questions that organized religion can no longer adequately address. The book features an epic quest for understanding and is indicative of the new spiritual paradigm moving across America. The 5-Star ForeWord Review of ‘An Upraised Chalice’ states “Nothing gets one’s attention like one’s imminent demise – the book chronicles the remarkable travels, adventures and near-death experiences that have marked the authors quest to discover the meaning of life. The practical insights detailed here, born of experience, cut across religious boundaries to convey a vibrant spirituality in plain, accessible language.” The book is predicated upon the concepts of karma and reincarnation and details the authors coming to terms with this inner understanding that he had as a boy and sought to understand more fully as he grew older. The book introduces the concept and the teachings of a “sacred Brotherhood,” an ancient, eternal organization composed of the great illumined saints, masters and sages of east and west, some of which were the principals of the world’s major religions. 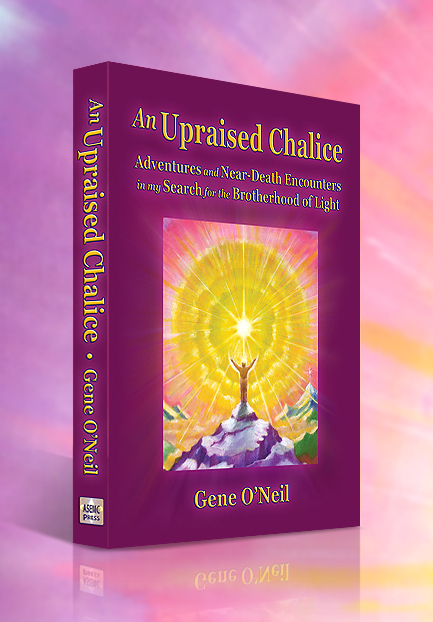 ‘An Upraised Chalice – Adventures and Near-Death Encounters in My Search for the Brotherhood of Light and What It Can Mean for You ‘ ISBN 978-0-9912635-0-9 is now available in print and eBook around the world from Amazon and in the US by Barnes & Noble and bookstores everywhere via New Leaf Distributing Company, the Ingram network. The eBook is available via Amazon, Barnes & Noble, and Apple iTunes.